Monitor and route assets all over the world. Gain a deep understanding of your assets by locating and visualizing where they are in real time, where they’ve traveled, and how often they’ve moved. Asset tracking provides the option to pay per asset and includes advanced features on top of Maps, Routes, and Places. It’s ideal for businesses who need to plan complex routes, geolocate assets precisely and frequently, manage and operate thousands of assets at scale, or understand real-time road conditions. Create multi-point itineraries with up-to-date data on distances between points and estimated travel times. Get suggested routes for up to 25 waypoints that factor in predictive and real-time traffic conditions. With optimized routes and the ability to locate and visualize trucks in real time, you can keep your drivers out of slowdowns, maximize your fleet utilization, schedule inactive trucks for maintenance, and decrease late deliveries. Whether your IoT assets are indoors, in remote areas, or distributed across hundreds of cities, you can track them with precision. You can enable location monitoring within a few meters for the assets that matter to you. Optimize shipments as you remotely track them from the assembly line to their final destination. Or allow users to understand their precise locations and surroundings by adding geolocation to devices without the need for GPS or specialized hardware. 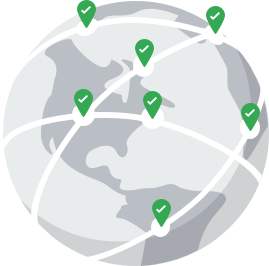 Whether you’re expanding your IoT distribution to Brazil or growing your fleet to cover all of Europe, we’ve got you covered with comprehensive data for over 200 countries and territories. Even in remote areas or cities where reception is poor, we often use cell towers and Wi-Fi to provide precise location intelligence wherever your assets are. In addition to the below, asset tracking includes most of the features of Maps, Routes, and Places. Return the precise location of indoor and outdoor devices and assets based on Wi-Fi and cell towers. Deliver travel times and distances for up to 25 different points along a route. Calculate current or future travel times based on real-time traffic. Determine and trace the route an asset has traveled and locate the nearest roads along any point of its journey. Vagabond used Google Maps Platform to build an application that shows the geographic location of each operator’s vending machine and information like stock level and how much cash it’s collected to determine when machines need to be restocked and to build efficient routing schedules.